Stamp a Sweet Impression: Taylored Expressions New Releases! Woooohooo! The day you've been patiently waiting for has finally arrived... it's RELEASE DAY! I've got a ton of information to share with you so grab your favorite morning beverage (mine happens to be Mountain Dew *grin*) and settle in! Today we are releasing two new stamp sets, one Key Ingredients kit, two Bundle deals, and hundreds of other products "fresh out of the oven"! Hundreds!? Yep... I said hundreds! Taylored Expressions is now a proud retailer of Copic markers with over 125 colors to choose from along with a full line of Spica Glitter Pens. You can see all the new Copics here and check out the rest of our new products in the Fresh Out of the Oven category! 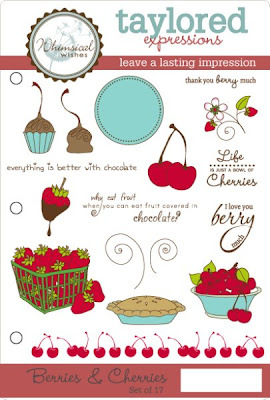 Berries & Cherries is one of our new additions to the Whimsical Wishes collection of stamps. Our illustrator, Nancy McKinney, hit it out of the park with this one! All of the images in this set are so 'berry' cute (yes... I know that was lame. lol)! 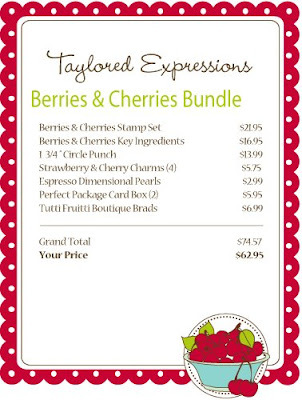 In addition to these adorable stamps, we're also offering the Berries & Cherries Bundle. I have hand-selected all of the items in this bundle to coordinate with the images in the stamp set. You get an opportunity to try a little bit of everything at a terrific discount! You can see all the products included in the Bundle in the picture above. For the list-makers among us, you can see a list of all the products included in the graphic below. And for those of you wondering what you can create with the items included in the bundle you can check out my cards below. I used cardstock, patterned paper, and ribbon from the Berries & Cherries Key Ingredients. In addition, I used the 1 3/4" circle punch (which is the size that fits the circle in the Berries & Cherries stamp set), Espresso Dimensional Pearls (to create the yummy dripping chocolate look on the strawberries). You also don't want to miss the fantastic strawberry and cherry pewter charms included in the bundle. You can see them in the photo above... they are so cute! Chillax, another stamp set in our Whimsical Wishes collection, is the second in our August Release! This set is so cute I can hardly stand it! I'm speaking from experience when I tell you that you'll be craving an iced beverage when you get done using this set! After I finished my set of Chillax cards I ran to the kitchen and blended a smoothie! 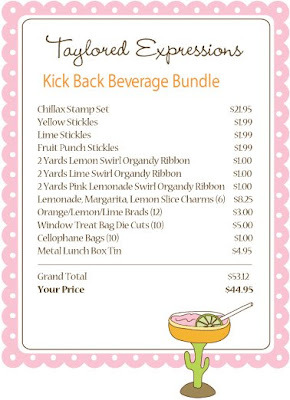 In addition to the stamp set, we're also offering the Kick Back Beverage Bundle! Once again, I hand-selected these products to coordinate perfectly with the images in the stamp set. There's a little bit of everything from brads to bling. Above you can see a picture of all the items included in the bundle and for the list-makers you'll find the graphic below with a list of all the items included in the bundle. For those of you who want to see what you can create using the items in the bundle you can check out my set of cards below. 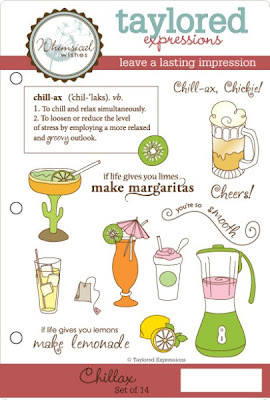 I used the Stickles from the bundle to highlight around the Chillax definition and on each of my drink images. The yellow swirl ribbon and the cutie charms are from the bundle too! You might also want to pick up the matching cardstock (Blush Red Medium, Sunflowers Medium, and Intense Kiwi) as well as the matching Copic markers (Y17 Golden Yellow, R14 Light Rouge, YG13 Chartreuse). 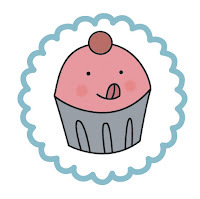 A Note From Cuppie: "To my Friends & Fans... Whew! Guess what? I took my first trip to the ocean back in June! The surfing was totally rad... cowabunga, dude!... but then I almost got eaten by sharks. Yikes! After narrowly escaping with my life I decided I needed to take a break before embarking on another adventure. But never fear... I'll be back to my adventures next month!